This is a dish that could easily be served to guests and it really isn’t that difficult. 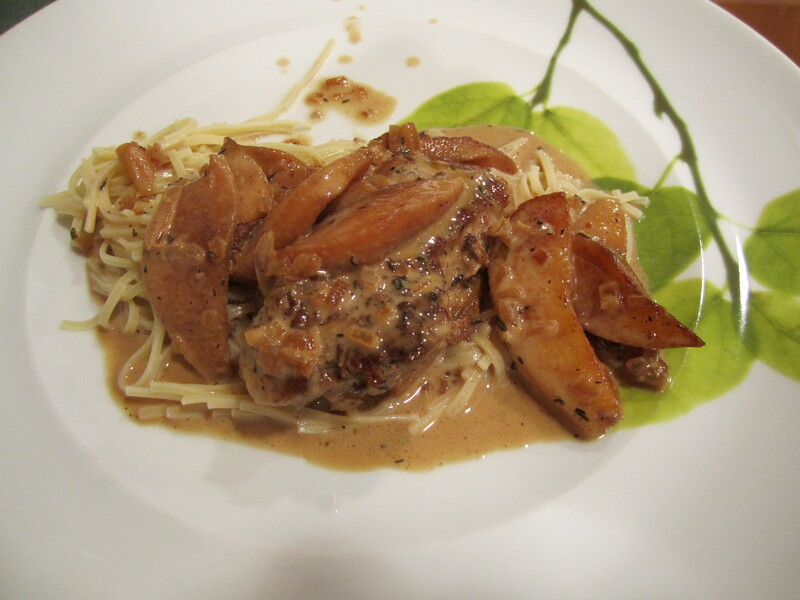 Pork, apples, cream, it’s almost dessert! the sauce is just delicious! 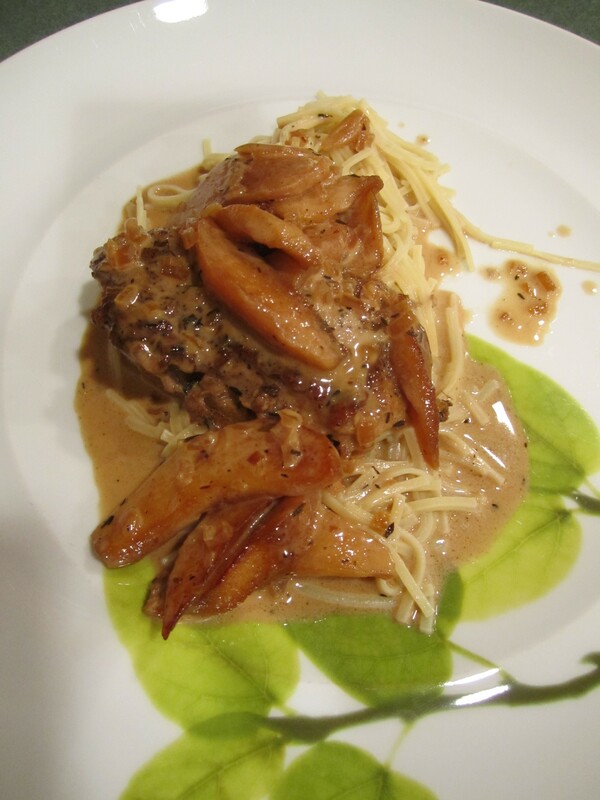 The original recipe has Calvados brandy and apple cider. Calvados brandy is quite expensive and though I tried the recipe with a less expensive apple brandy, I was happier with my version. And I don’t like apple cider, so I didn’t even try. I was able to substitute both using concentrated apple juice. Yes, I know that sounds a little strange but try it. I have included the link to the original recipe, too (which by the way has rave reviews) so that you can decide which one would be better. 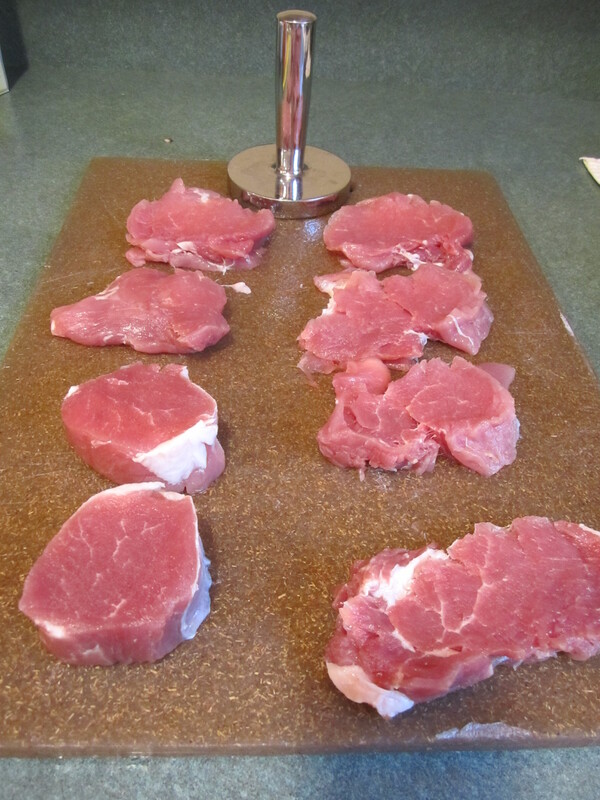 Trim pork tenderloin of any excess fat. Cut into 1 inch thick slices. Pound each slice gently with a heavy mallet (or rolling pin) until about 1/4 inch thick. It does not take too many whacks to get the medallions flattened. 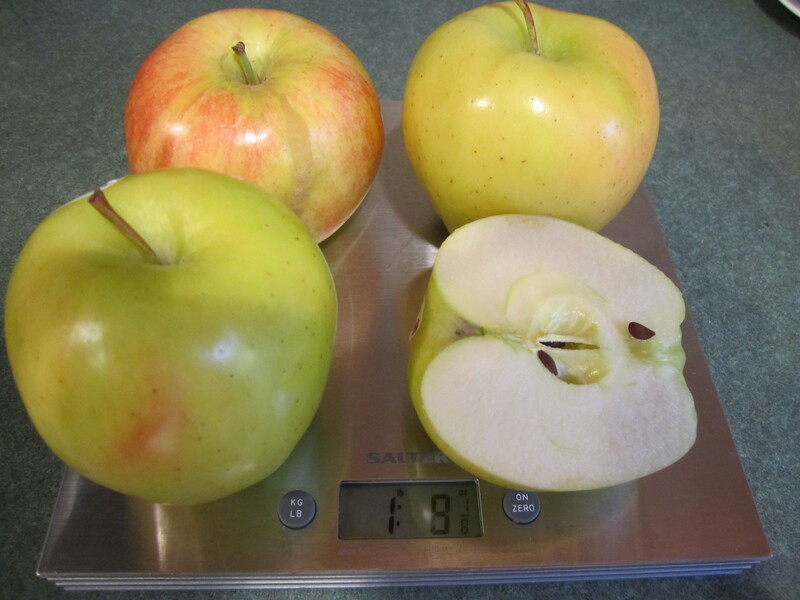 Peel, quarter and core apples then slice 1/3 inch thick. 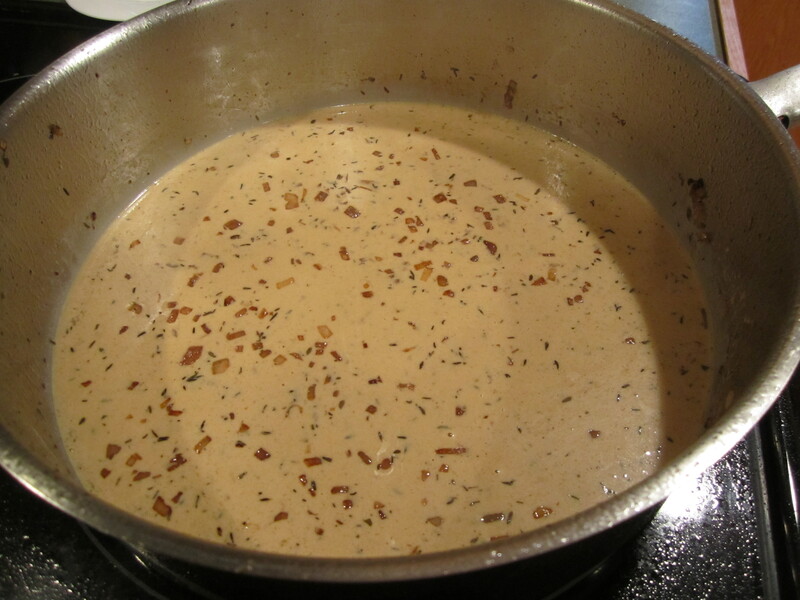 Melt 2 tablespoons of butter in a large heavy skillet over medium high heat. 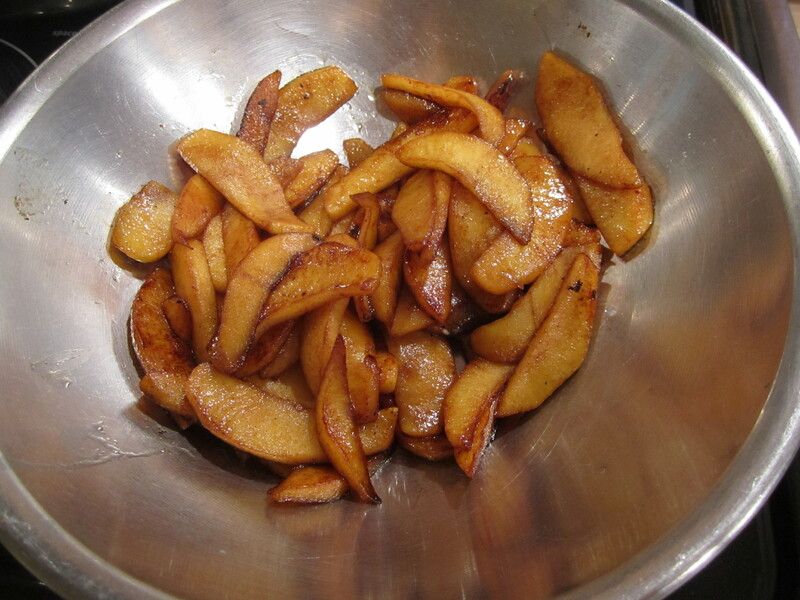 Add apples and sugar to skillet and saute until golden brown, about 5-6 minutes. Set aside in a bowl. Clean skillet. 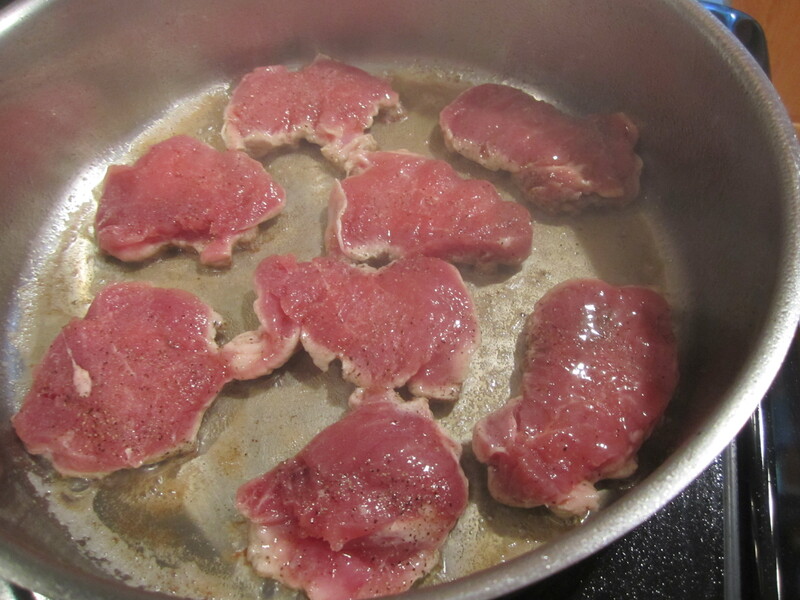 Melt 1 tablespoon of olive oil and 1 tablespoon of butter in same large heavy skillet over medium high heat. Lightly salt and pepper each side of pork. 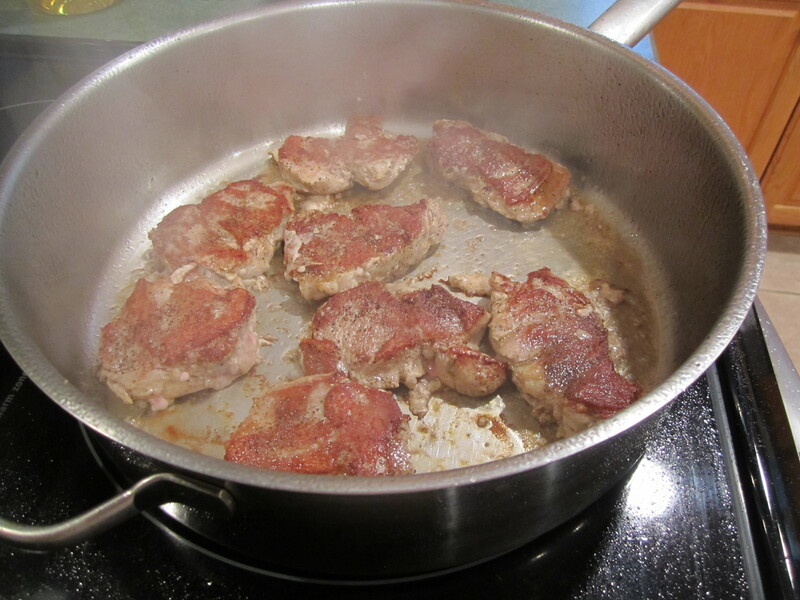 Place pork into skillet and saute about 2 minutes on each side. Transfer to a plate. 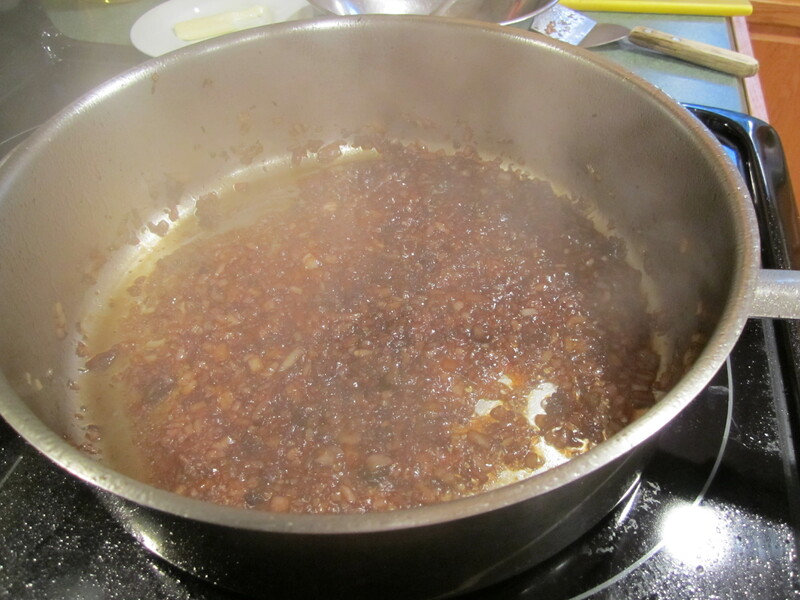 Melt 1 teaspoon of olive oil and 1 teaspoon of butter in same skillet, over medium high heat and add shallots and thyme. Saute for 2 minutes. 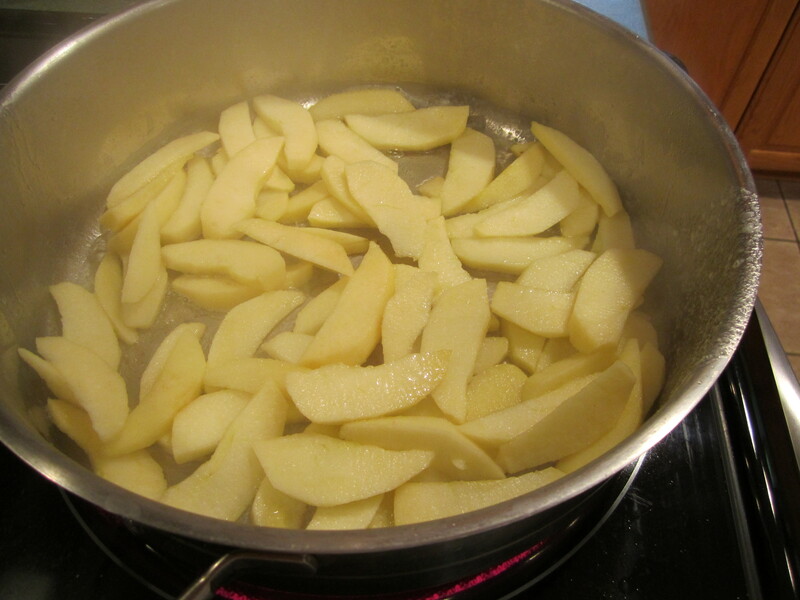 Add 1/4 cup of concentrated apple juice and simmer for one minute. Add heavy cream and the other 1/4 cup of concentrated apple juice. 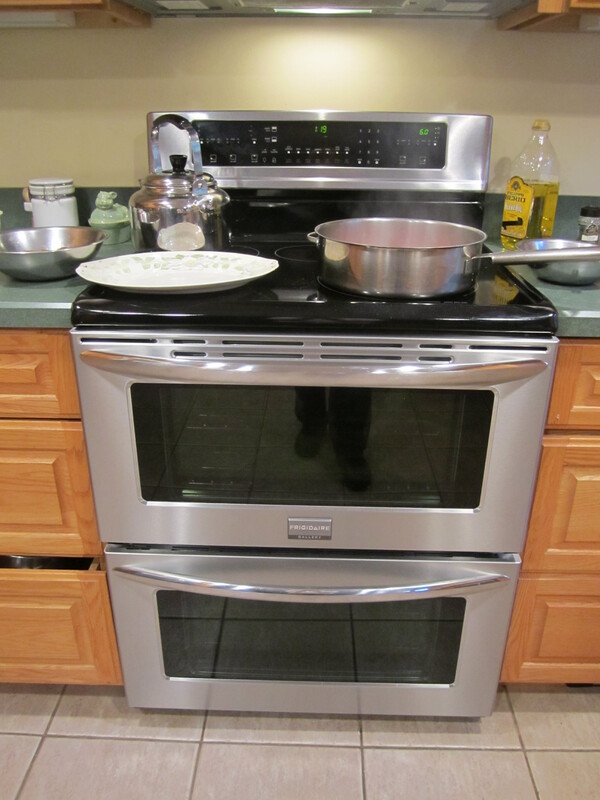 Simmer one minute. Remove from heat. 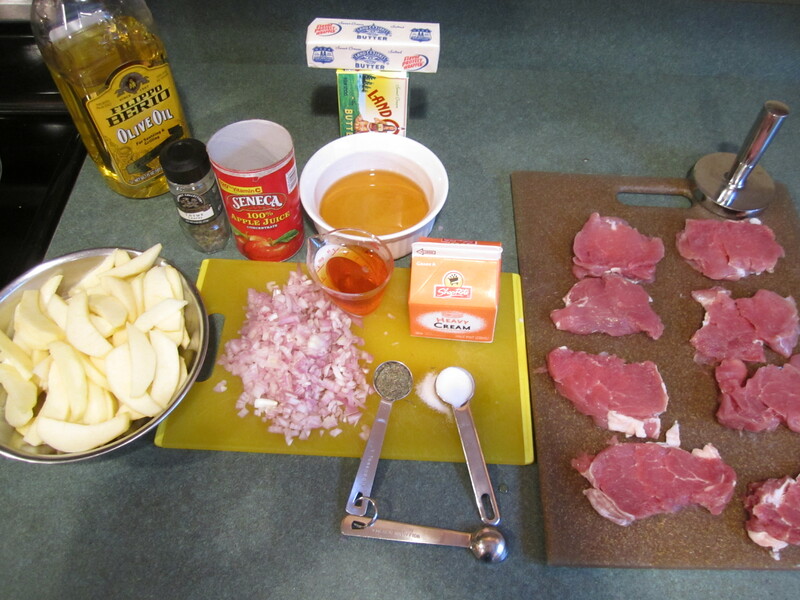 Add the pork to the sauce in the skillet, coating each piece with sauce. 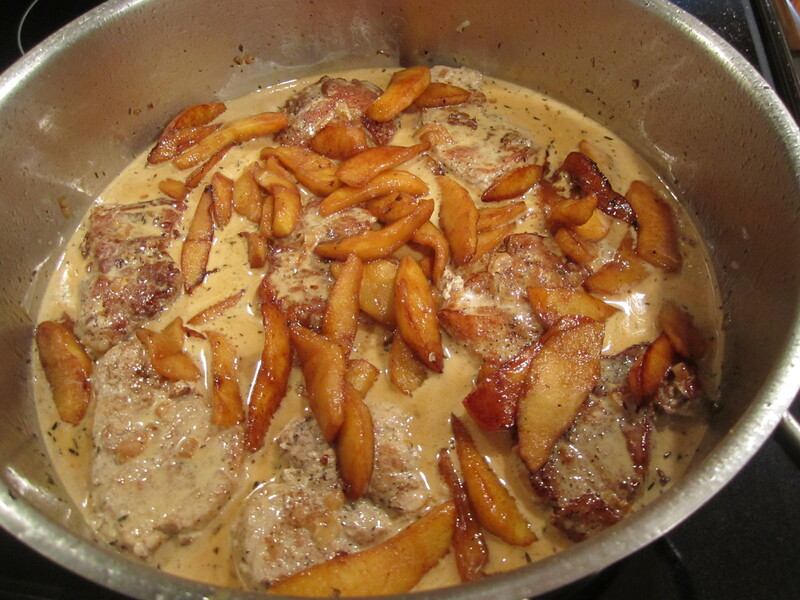 Then add the apples back in, nestling them around the pork. Serve immediately.